Nick D'Agosto & Krysta Rodriguez Spill on "Trial & Error"
Take Parks and Recreation and mix it with Making a Murderer and you get Trial & Error, Krysta Rodriguez told us. "Rec-ing a Murderer?" star Nicholas D'Agosto chimed in. The new NBC comedy stars D'Agosto as Josh Segal, a defense attorney tasked with defending Larry Henderson, a poetry professor (John Lithgow) who's arrested for murdering his wife. It's a spoof of true crime shows that have swept the nation. "It's hilarious for starters," Lithgow said. "It is a send up of something that is the opposite of hilarious, which is deadly serious, these crime documentary series that are so popular nowadays…It's shot in exactly the same way." John Lithgow Dishes on New Show "Trial & Error"
But did Larry do it? "You will at home get to play along and cast your bet as well," Rodriguez, who plays Larry's daughter, told E! News. "It's very funny, it's very outrageous, but at the end of the day we're all really trying to solve something very serious," D'Agosto said. "We think it does work because the world is really grounded. There are real interpersonal relationships going on. One of the major ones is a sort of father-son relationship that sort of evolves between my character…and John's character." The cast also includes Sherri Shepherd as Anne Flatch, Jayma Mays as Carol Anne Keane and Steven Boyer as Dwayne. 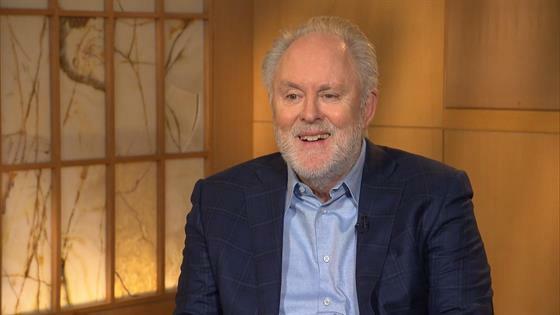 And for Lithgow, who has experience playing both murderers and completely innocent folks, it's a way to strike back at a certain genre of television: reality TV. "I watched The Jinx, or most of it. I don't watch a lot. I'm not a fan of it," Lithgow said of true crime shows and reality TV. "There's something in me that almost resents reality television." Lithgow said during the six seasons of 3rd Rock From the Sun was when reality TV really took off. "In a sense Trial & Error is my vengeance, it gets back at them," he said. Trial & Error premieres Tuesday, March 14 at 10 p.m. on NBC. It moves to its regular timeslot at 9 and 9:30 p.m. the following week.